We offer our customers a Natural Cider of the Best Quality. Made from the oldest tradition with a lot of mime and art. The experience of many generations (more than 200 years) and the commitment in the own plantation of apple and selection of the apple, has led us to achieve today a harvest of its own with the following characteristics: strong cider, more aroma and flavor. Being, at the same time, a soft cider and easy to drink. With only 6% vol. of alcohol. For many years our efforts have been aimed at obtaining a cider made exclusively with native apple and, in fact, we have achieved it today. Nowadays, our elaboration is, when the harvest allows, 100% with apple of Gipuzkoa. It is worth mentioning the project that we have undertaken to produce organic cider with apple trees typical of the village. From all this and more R.ZABALA SAGASTIGINTZA deals with: the planting, maintenance, care and attention of the manzanales own the farmhouse. 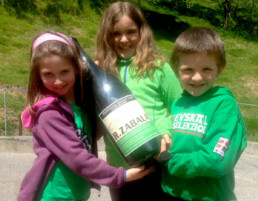 We are pleased to express our joy at having won, three times, the TXAPELA or, what is the same, the 1st prize of the Contest for the Best Cider of all Gipuzkoa in 2004, 2006 and 2010; along with the 2nd prize in 2007. In addition, among others, precedes the 1st prize for the best cider obtained in the year 87. It should be noted that these awards are granted by the Provincial Council of Gipuzkoa and said contest is characterized by its seriousness and rigorous process of selecting the best cider. So much so, that at present we are the only cider with 3 Txapelas. Our customers can enjoy the best quality natural cider, both in the time of the “Txotx” in the cider itself and at any time of the year in the bottle. We recommend its consumption in the bottle at a temperature of not less than 10 degrees in order to better enjoy its properties, aromas and its authentic 100% natural flavor. We are grateful to our customers, who each day are more, both at state and European level and also worldwide, who place their trust in us when accompanying all kinds of food with our quality cider and invite, from these pages, to taste it to those who have not yet tasted it. For the optimum elaboration, we have just renewed the infrastructure with new machinery of the highest technology but always maintaining the most pure and traditional style. It is in R.ZABALA UPATEGIAK where we make the preparation of cider with great care, attention and commitment. At any time of year, we sell at stores, stores, stores or retailers in 3, 6 or 12 bottles cases. We also sell sales both nationally and globally, thanks to EXPORTS, especially in the US. “In Paris, a study was carried out on the nutritional value of cider, the doctors recognized the benefits of this drink, reaching the following conclusion: of the 3000 calories that are daily necessary to man, cider can be supplied from 250 to 300. But It is not just about your food. Cider is recognized as having a great bactericidal power. Natural cider can be consumed in quite considerable amounts without causing any harm. On the contrary, it protects against the calculations and combats the gout.